BOX CAR BASICS: Norm McIntosh explains how to attach a grill to a box-car floorboard during the American Box Car Racing International's summer youth program. Free classes are available from noon to 4:30 p.m. Wednesdays through Fridays through July 27 at the Kunia Box Car Track. 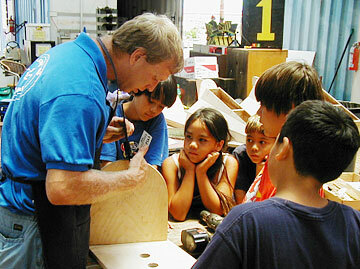 Kids ages 9 may sign up for one to five days of instruction in driving, safety, building and repair of box cars. For an application visit boxcarracing.org. Call 947-3393 or e-mail bc@boxcarracing.org. The National Tropical Botanical Garden is offering a work-study program for college- and university-level students, covering the establishment, development and maintenance of a garden. Students receive a stipend and earn college credits. Coursework takes place at the National Tropical Botanical Garden headquarters on Kauai and at member gardens on the neighbor islands. Applicants must be college-level students or have experience in tropical horticulture, botany, conservation, ethno-botany or science-related fields. For an online application visit courses.ntbg.org or call Brianna Wilkerson, (808) 332-7324, ext. 250; e-mail at hortintern@ntbg.org. A Holoku Gala will be held at 4:30 p.m. Saturday at the Kauai Museum in celebration of the formal gown of Old Hawaii. Organizers hope to make it an annual event. Entertainment will include Manulele, Emma Veary and Kekai Chock. Food, wine and beer will be served. Tickets are $75; $60 for Kauai Museum members; to benefit Malama Pono, the Kauai AIDS Project. What are you doing on the weekend of June 29? How about helping with the biggest eating event of the year, over on the grounds of Honolulu Hale? It's for charity, after all. More than 1,000 volunteers are needed for various tasks at this year's inaugural Flavors of Honolulu, the eating-drinking-entertainment event that takes the place of Taste of Honolulu from June 29 to July1. Sign up and you'll get a T-shirt and three admission tickets, plus the satisfaction of working for the benefit of Abilities Unlimited, the non-profit group that replaces Easter Seals Hawaii as the beneficiary of the event. The charity helps place people with disabilities in the workforce. Download a registration form at www.abilitiesunlimitedhi.org or call 532-2100. By the way, if you want to buy tickets in advance, or help sponsor the event, visit the same Web site for details. Or call 532-2115. 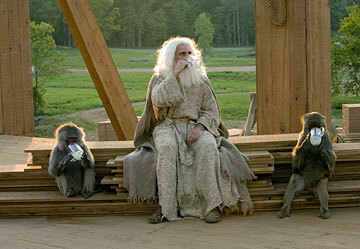 Steve Carell plays a reluctant Noah in "Evan Almighty," the follow-up to "Bruce Almighty."